A 21-year-old woman with special needs who went missing three days ago has been found by searchers. A 21-year-old woman with special needs who went missing three days ago was found by searchers late Sunday afternoon. 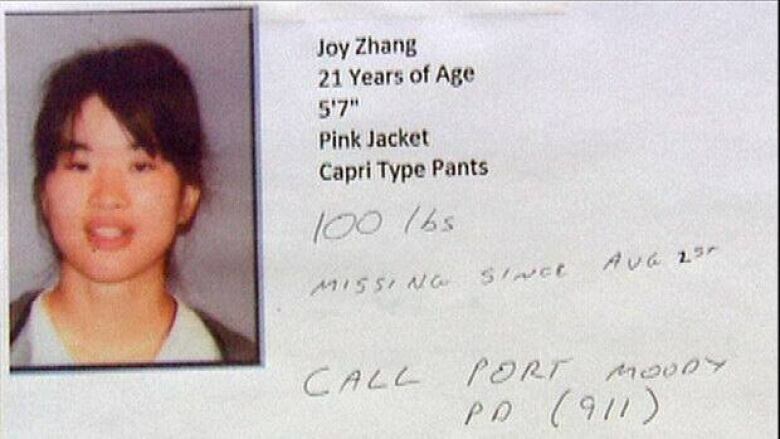 Joy Zhang, who has the mental capacity of a 10-year-old, was last seen Thursday afternoon at Port Moody's Sasamat Lake, where she had walked away from a group outing. Coquitlam Search and Rescue commander Dwight Yochim said 95 per cent of people with a condition similar to Zhang's do not respond when their names are called, further complicating search efforts. "So we had to go and find her, and as we swept through the forest, it didn't take the team too long to stumble across her," he said. "She was just sitting in the forest, in good shape. She's talking up a storm. A little thirsty, but doesn't appear to have any injuries at all." Yochim said Zhang was found about 1.5 kilometres north of the lake in a forested area between two trails. Earlier on Sunday, searchers had moved off the trails to conduct a systematic grid search in the rugged terrain around the lake. Searchers suspected Zhang may have been hiding somewhere, waiting to be found, and was too afraid to answer the calls of volunteers looking for her. On Saturday, Zhang's family members and friends walked the trails, calling out her name and singing her favourite song, hoping to coax her out.